Business is booming in the Republic of Ireland, especially for our small- and medium-sized businesses. Irish SMEs are important for the labour market as a whole. They provide 70 percent of all non-financial jobs in the country. Our SME value added per person employed is an average of 71,300, which is 1.5x the EU average. But how doe Irish SMEs stack up in the digital landscape? After all, there are one million people around the country who live and work in 540,000 premises that don’t have high-speed broadband connections. With nearly one-fifth of the country working and living without access to reliable high-speed broadband, what can that mean for the Irish SME Health Index? The 2018 edition of the report presents some good news, but it also shares some opportunities for Ireland to do better. E-commerce is an integral part of doing business in the digital age. It’s worth €12.3 billion in the Irish economy or 6 percent of the total GDP. Moreover, the government expects its share of the GDP to grow exponentially. Irish consumers expect businesses to have a web presence. The report shows that 54 percent of consumers will take their business to your competitor when their preferred business doesn’t have an online buying option. We all know that an internet company that shall not be named is the bane of our digital existence if you live in a part of Ireland where you have few to no options. Despite the obstacles we face, Irish SMEs outperform every EU member state – including the UK – in the realm of e-commerce. Hooray! Irish businesses are e-commerce legends. But that’s not the whole picture. The European Commission Digital Economy and Society Index that says Ireland is the top e-commerce performer only counts SMEs. What’s the problem? 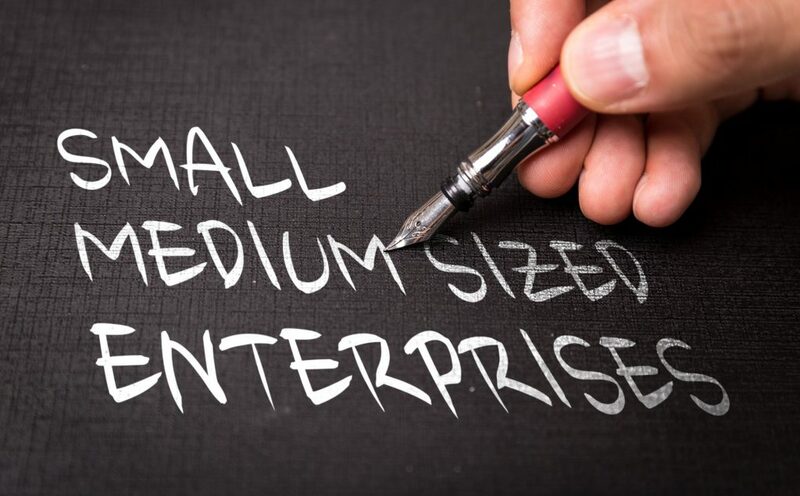 “SMEs” in this case refers to small- and medium-sized businesses but leaves out micro-businesses. Micro-businesses in Ireland make up 93 percent of all SME enterprises and 92 percent of the economy. If the DESI only counts a tiny portion of Irish businesses, we can’t confidently say that Ireland is ready to take on the world. So, let’s get down to business. What does the SME Digital Health Index teach us about the present state and future of Irish businesses? What’s the story with SMEs in Ireland? We read the report, so you don’t have to (but you should). And we even wrote a summary of the takeaways for you. See the five key SME Health Index takeaways here. The SME Digital Health Index set out to learn more about how Irish SMEs rate their digital skills like communicating, transacting, and boosting their productivity. It’s no surprise that 70 percent to Irish SMEs are having the craic and achieved an A or B grade for communication. Our burgeoning Travel & Tourism sector performed particularly well. Things took a turn when it came to transacting. Only 32 percent received an A or B grade here. When it comes to boosting, things are in a real state with a shocking 18 percent achieving a B grade for user productivity and analytics software. The key takeaway: putting up a website is a good shout. But we need to teach SME owners and employees that it isn’t the end of the line. A focus on boosting productivity software or SaaS is critical if we want to continue to lead the pack. Whether its Facebook, Instagram, or a website, eighty-five percent of Irish businesses run at least one digital asset. That’s great. But our attitude towards digital presence seems to begin and end with being online. If 85 percent of Irish SMEs are online, why do only 30 percent of them accept digital orders? We need to see websites as more than digital business cards and start looking at them as living, breathing parts of the business. Where there’s a will, there’s training. Education and training opportunities will tackle the group’s most significant pain points, such as concerns about security or beliefs that e-commerce wouldn’t suit them. Here’s a shocking statistic: under 1 in 10 SMEs say they enrolled in public or private digital skills courses. Micro-businesses spend just €180 a year on training. SMEs spend €1,250. There’s plenty of programs out there from the Irish Government to the IE Domain Registry. But who knows about them? We expect relatively few people do. The report says 27 percent of people get their digital advice from friends, family, or colleagues. Seventeen percent don’t ask anyone. When was the last time you walked into your Local Enterprise Office (LEO)? LEOs around the country are the heartbeat of local commerce, but some of them are woefully outdated. Many of them also provide mentorship and advice, but they do little to produce digital support. The Trading Online Voucher Scheme is one way to help small businesses to get online. The €2,500 grant is a great start, but we need to go further and be specific about what companies need to do to not only launch an online presence but succeed there. People who work in SMEs say they don’t want to sit in a stuffy conference room in some hotel off the M50 for digital knowledge. They are more interested in digital mentorship. Think about it: who cares about random knowledge about Facebook analytics? People want to know what tools impact their business AND how to use them. The SME Health Index summary recommends an investment in SME mentorship provided by sector specialists. To work best, it needs to happen at both the sectoral and representative level. A quick search for “digital skills mentorship” pulls up plenty of results – int he UK. Here in Ireland, there are options. But they also tend to be general in nature and classroom based. They also come with a selection process rather than presenting opportunities for all Irish businesses. With so many Irish businesses having no access to high-speed connections, its no wonder that all of the above issues exist. Living in Dublin or Galway city shouldn’t be a pre-condition for running a small business. Yet, the high-speed broadband map is full of amber areas that are the target for the State Intervention of the National Broadband Plan. The report says that only 50 percent of SMEs in all of Munster rate their internet connection as being excellent. The number falls to 39 percent in Ulster and Connaught. Even in Dublin, only 70 percent love their internet speeds. While it doesn’t seem like there’s much the average person can do, there is. It’s important to continue to make the case to local councilors and TDs that broadband isn’t a convenience. And it’s certainly a luxury. The issue of broadband isn’t a matter of watching Netflix. Though, some parts of Wicklow are still hoping to be able to do that by 2024. Providing high-speed internet is fundamental to both local economies and the national GDP. Moreover, Irish businesses should have the option to operate digitally from their premises whether its Silicon Docks in Dublin or deepest, darkest West Cork – or even Kerry, if we choose! Ireland has an incredible starting position in the world of SME commerce. Most of our labor force works for SMEs, and they add huge amounts of value. From our tech startups to our creative culture, Irish businesses are in a unique position, and they’re crushing it. Our small- and medium-businesses are even European leaders in the field of e-commerce. Unfortunately, we’re not meeting our full potential. A lack of digital skills and the support infrastructure means that Irish businesses aren’t making the most of their web presence – yet. We could use not only more skills campaigns, mentorship, and infrastructure, but we also need it to be accessible to everyone. If SMEs mean so much not – just imagine what they could do when our digital health potential becomes fully realized. If Lady Gregory were here today, she’d probably realized that we waste a lot of time in Ireland – and most of it is because of buffering. Irish SMEs are a vital part of our economy and our national identity. And the SME Health Index for 2018 shows that we’re in an excellent position to take on Europe. To do that, we need more than digital calling cards. Our digital skills, particularly when it comes to running our digital presence, leave something to be desired. Fortunately, we know how to close that gap. Mentorship, skills investment, and broadband speeds less changeable than our weather would all be very welcome. Are you inspired to take your business to the next level? Get your business online with your friendly Irish web host. Click here to learn more, and don’t forget to get in touch with any internet-related questions.